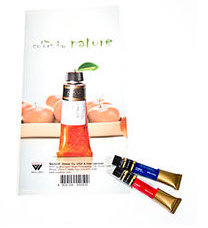 Free Valspar Paint & Mini Roller!! 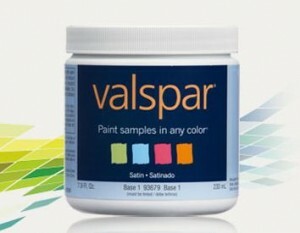 Be one of the first 750 to fill out the short form HERE daily at 10am EST and get a FREE Valspar paint sample of your choice, a mini roller and a coupon! 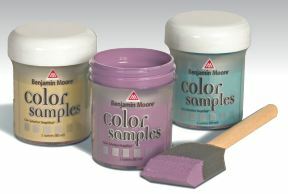 Free 2oz Color Sample @ Benjamin Moore!! Print out this coupon HERE to get a FREE 2oz color sample from Benjamin Moore! Coupon expires 2/28/12. Find your local Benjamin Moore store HERE! Free Kelly Moore Paint Sample!! 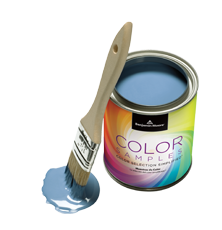 Fill out the short form HERE to get a FREE Kelly Moore paint sample! 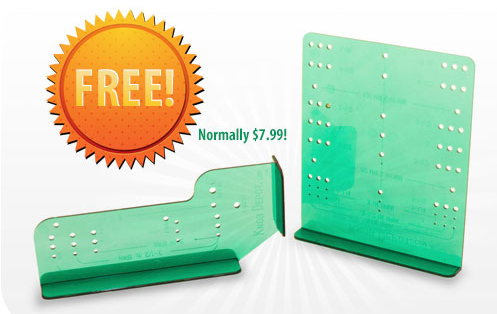 Fill out the short form HERE to get a FREE X=Acto blade sample! Free Quart Of Glidden Paint!! 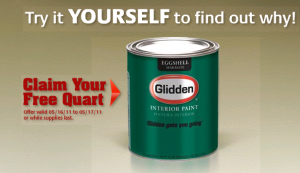 Click on the paint can that pops up on the top of the screen HERE to get a FREE quart of Glidden paint! You even get to choose the color! Please allow 6-8 weeks for delivery. Sign Up To Be A DMC Mentor!! You can sign up HERE to be a DMC Mentor! As a DMC Mentor, you can pass cross stitching on and share your love and passion for cross-stitch with a friend, daughter, grand daughter, scout troop, class, or anyone you think would enjoy cross-stitching as much as you do. Its so easy. As a DMC Mentor youll help ensure the heart warming craft of cross-stitch thrives for another generation. Youll also enhance the lives of others and improve your own stitching skills while gaining fresh ideas, energy and enthusiasm from novice stitchers. To help you get started, DMC has provided you with all the tools youll need to share your passion for stitching. Well immediately send you this FREE DMC Cross-Stitch Mentor Kit. In this kit youll find 4 mini cross-stitch starter kits that feature a beautiful floral design to be used for your first lesson. Your students will be so proud once theyve completed this design. Weve also included a Mentor Design Brochure that features nine additional projects exclusively designed by DMC for subsequent lessons. And a gift for you, youll find your own DMC Mentor Pin to identify you as an official DMC Mentor. (Please allow 4-7 weeks for delivery.) This offer is available for the U.S. & Canada only! Explore Museums Virtually For Free!! You can use Google to explore museums virtually for FREE! Explore museums from around the world, discover and view hundreds of artworks at incredible zoom levels, and even create and share your own collection of masterpieces.